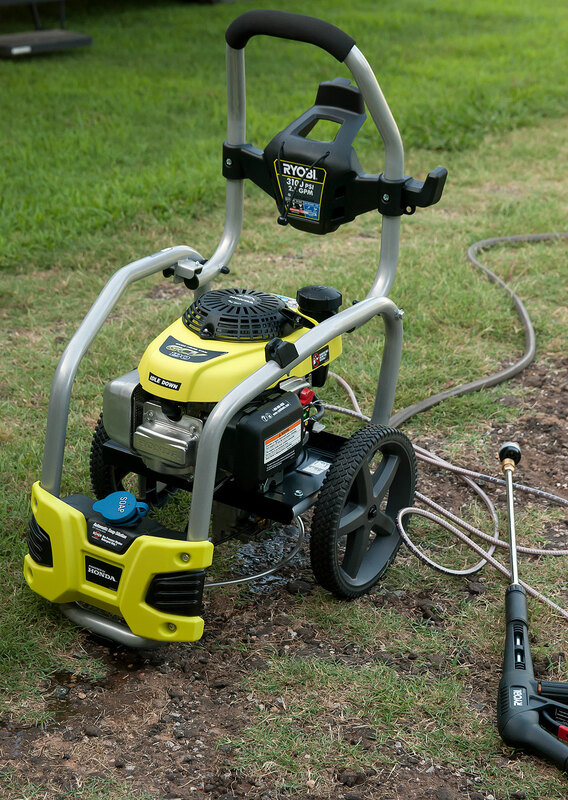 This is our new power washer. It is full-featured and powerful, and will clean pretty much anything. Nine years ago I inherited a small Karcher power washer. I used it for a few years after that, but it eventually died. (If you need a good Briggs and Stratton engine, email me.) You can read about my previous power washing adventures here, here, and here (links). I bemoaned its absence to my wife Abby last month, explaining to her that stuff like the siding was getting greener and darker from the ubiquitous dark green mold that grows on it. 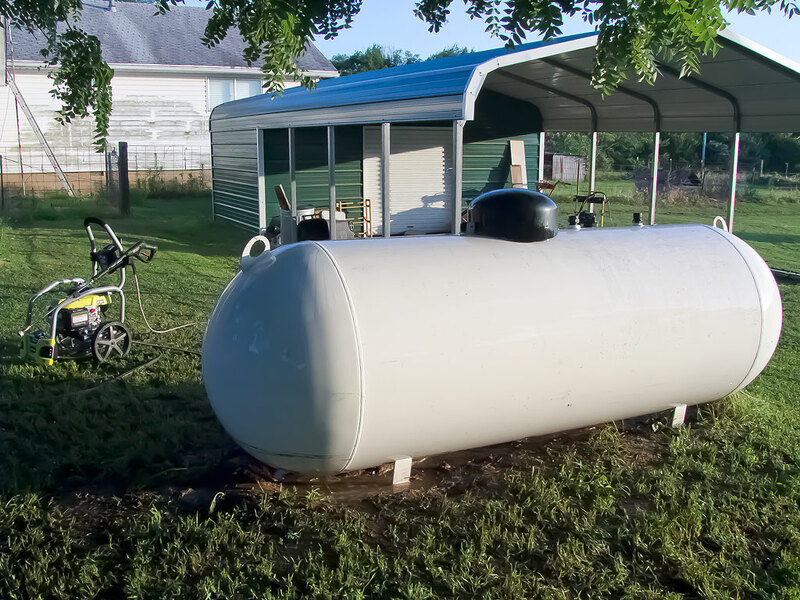 I also wanted to be able to power wash the RV, the floor in the garage, and the propane pig, as well as wash our cars. A few days later, she came home from a trip to town with a birthday present for me, the nicest Ryobi power washer Home Depot offered. Were opened it to discover that particular one was damaged before we got it, so we returned it for a another with little difficulty. Props to Home Depot for that. For the past two weeks I have been working outside most nights, which I know is good for me on many levels. The patch is green from abundant rain. The sky and the evening light have been showing off. The work is visceral and satisfying. 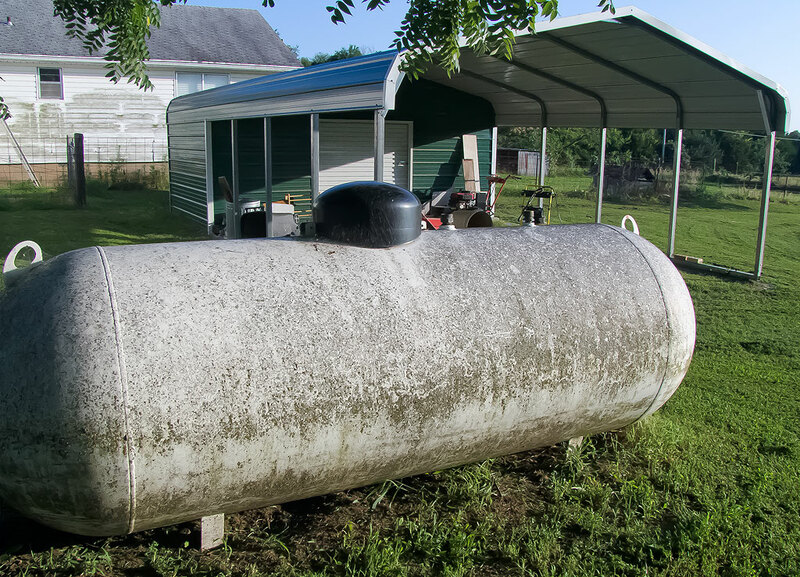 This is the propane pig with eight years of grody on it. This is the propane pig just 15 minutes later, clean and white. Cue the mouthwash commercial “DING” sound. In the background, you can see mildew on the house’s siding – there is work left to be done. Wow. That is a *huge* difference. Tracey wooed me in part by using his pressure washer on my deck. So satisfying!